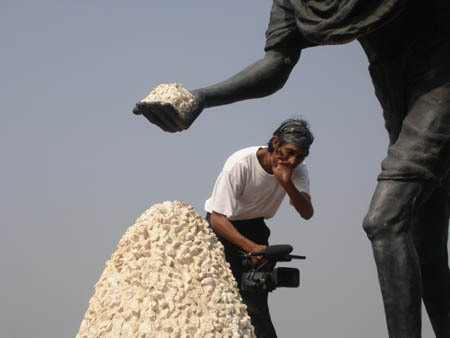 Director's cut and the longer version of `In Search of Gandhi', THE SALT STORIES is a road movie documentary set in modern India that follows the trail of Mahatma Gandhi's salt march of 1930. In 1930, a group of Indians led by a frail, elderly man marched a distance of 241 miles. They marched for salt. Mahatma Gandhi was able to craft an anti-colonial, nationalist movement around the most basic issue of livelihood: the right of Indians to make and consume their own salt. 77 years later, the Wide Eye Film team followed the trail of the famous Dandi salt march, stopping at the same villages and towns, in search of Gandhi's legacy. Set against the backdrop of Gandhi's original journey, this is a road-movie about issues of livelihood in modern, globalizing India. It is a documentary about 'the salt stories' of our times.